Street art has gained a staggering amount of legitimacy in recent years. For example, graffiti artist Banksy is one of the most popular and famous artists in the world right now, with artwork being sawed off of the side of buildings and sold to collectors for small fortunes. Bansky, despite having kept his identity a secret, is also somehow a huge star with a Simpsons couch gag to his name. A Banksy piece worth potentially tens of thousands of dollars was up less than a day before getting defaced. 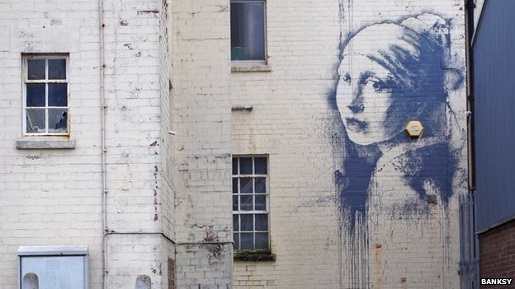 Banksy’s “The Girl with the Pierced Eardrum,” a take-off of Johannes Vermeer’s “Girl with a Pearl Earring,” was slathered with black paint, disfiguring the artwork that went up on Monday. Much like Banksy, the defacer worked under the cover of the night, so on Tuesday morning, there was a big splash of black paint ruining the art. Still, if you’d like to see the piece and can get to Bristol, England, then do so. It’s located near the city’s harbor on Hanover Place. Bristol is also home to a lot of other Banksy’s work, so you’ll have plenty to look at.